Fast and easy to use – you can treat more nests in less time. 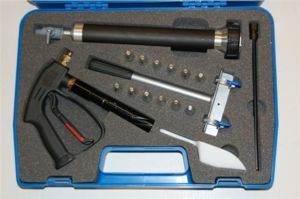 Reduced preparation time before use – no pumping – insert the CO2 cartridge, an initial supply of 12 come with the kit and it’s pressurised ready to use. Operation is easy, the equipment is light and self-contained – and there is no requirement to recycle gas cylinders. A reach of 4.5m plus is possible with the GPS aluminium lances and the health and safety risk of using ladders is avoided. If you already own a GPS Gaspot and would like to use a PA2 alongside it please ask about our conversion kit.